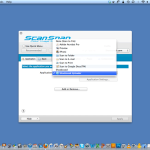 Hey Mac ScanSnap users, we didn’t forget about you! We’ve just released a new Shoeboxed Profile Maker for Mac! Now Apple users can enjoy scanning items directly from their Fujitsu ScanSnap into Shoeboxed in one seamless process that won’t disrupt normal workflow in the slightest. Simply scan your receipts, business cards and other documents using your ScanSnap as you normally would. Then, using our new Profile Maker, you can have these files simultaneously sent to Shoeboxed, where we data extract, organize and archive the data for you. To begin enjoying the benefits of our new Profile Maker immediately, simply download the free Profile Maker here and then follow the easy step-by-step installation instructions, found here. For more information, including screenshots, you can also visit our ScanSnap page here. Note: The Shoeboxed Profile Maker is available for both Windows and Mac users. If you’d like to download our Shoeboxed Profile Maker for Windows, please click here. If you have any feedback or questions about our new Profile Maker or how to use your ScanSnap with Shoeboxed please reach us 24/7 at help@team.shoeboxed.com or give us a shout on Twitter @Shoeboxed. We’ll be sure to keep you in the loop as more upgrades and fun new features are released! Win a Free iPad Mini in the Shoeboxed Messy Desk Contest!